Question: Which group described themselves and their music from the outset as, “A mess of eyeliner and spray paint” and not long after said, “The most important thing we can do is get massive and throw it all away?” Well, they did get massive, They racked up 37 UK hit singles including two number ones, 13 albums including the 16-million selling double debut in 1992, lost a member a third of the way through their career and, in 2016 have recorded the official anthem for Wales’ Euro 2016 campaign. 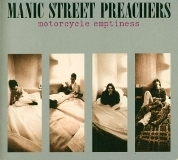 Answer, the Manic Street Preachers. The band came together in Gwent, South Wales in 1986 with the original line-up being singer James Dean Bradfield, guitarist Nicky Wire, bass player Miles Woodward and drummer Sean Moore. Their roots were in punk but after a couple of years, Woodward felt they were drifting away from punk and quit. Wire moved from lead guitar to bass and within a few months their roadie and driver, Richey Edwards joined the band. He was not renowned for his musical talent, but his lyrics and design were a great asset. It took five years until they gained any kind of success and it was a slow burn, You Love Us was their debut hit reaching the dizzy heights of number 62 in 1991, three months later Stay Beautiful reached number 40. The following year Slash ‘N’ Burn made it to number 20 and then came the song that I tell the story of this week, Motorcycle Emptiness. Nicky dedicated the song to Albert Camus the philosopher who had a documented influence on Rumble Fish. The song received extra publicity in 2003 when an electro version of the hook was used by T-Mobile for an advertising campaign which upset a number of fans because they complained that it conflicted with the song’s anti-consumerism message where they call it a shallow dream. It seemed at the time that Richey had issues with money and had been refused loans and became a troubled soul. His personal problems intensified as he also battled anorexia, self-harm and alcoholism. At the beginning of February 1995 Richey and James were due to fly to the USA for a promotional tour but Richey never showed up. On the 1st February he was staying at a hotel in London, checked out at 7am, withdrew £200 from his bank cashpoint and then drove to his apartment in Cardiff. There had been various sightings of him around the Newport area and one taxi driver picked him up and drove him around the valleys, visited Richey’s childhood home and at the end of the journey paid the driver the £68 fare in cash. Just like Elvis Presley many have claimed to have spotted him one being at a market in India. On 23rd November 2008, having been missing for over 13 and a half years, he was declared legally dead. He also becomes a member of the infamous 27 club.